THAT LAMBRETTA and I had travelled together all over north India. My friends still call her KLD, in reference to her number plate. When we all get together, KLD’s name pops up quite often. She was both chariot and chaperone to many of my friends. They would borrow her to take their girlfriends out. Quite often she would refuse to start, oblivious to the embarrassment of the young man who was kicking away at the pedal. With the girlfriend giggling in the background, the rider would then resort to a running start and then twist the accelerator for dear life. My cousin inherited her, when I left Delhi. And, somewhere down the line, somebody sold her. How I wish I had her now in the garage! Our favourite run was from New Delhi to Chandigarh. Just the two of us, mostly. A regular stop was at one of the dhabas in Panipat. One of the covers of this Anniversary Issue is about 10 great battlefields in India, and Panipat is on that list. While reading Senior Special Correspondent Rekha Dixit’s account of the battle between Babur and Ibrahim Lodhi, the history student in me was travelling back in time. I was also having a parallel journey on the Lambretta, puttering out of St Stephen’s College on a winter morning, onwards to Panipat and beyond. Quite strangely, there is a Lambretta connection to our second cover story, too—Inside North Korea. The writer, Dr N.J. Nadarajan, has travelled worldwide. His wanderlust began after he had a bad fall from a Lambretta. A fall that left him in intensive care for a month. Once out, he realised that life was too short for cookie-cutter days. What’s the charm if yesterday, today and tomorrow are the same, except for the dates? So, he set off to Nepal with best friend Salim in 1984. Not long after, Salim drowned in the sea in Kerala. Nadarajan was shattered. Clinically depressed, he was almost about to give up on his postgraduate course in ENT in Ahmedabad, when his teacher Dr Jawahar Talsania stepped in. Talsania got him a locum’s position with a friend. 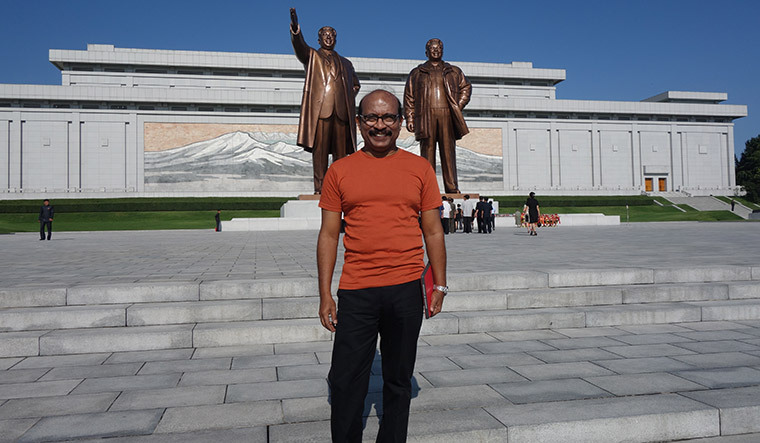 During that break, Nadarajan travelled across India for eight months, healing body and soul. Over the years he has travelled to 68 countries. No 1 was Nepal and No 68 North Korea. He has never taken a guided tour, except in North Korea. I hope you will love reading his account of the Hermit Kingdom as much as I did. Much closer to home, this issue has Special Correspondent Rachna Tyagi’s piece on Mumbai’s art deco buildings. Who knew that Maximum City had the most art deco buildings in the world, after Miami, Florida! The buildings are more than just structures, argues Rachna. She says they mark a shift in Indian thought and architecture. In another package, Special Correspondent Cithara Paul talks about a different sort of broad-mindedness—that of interfaith couples. Today, at least some interfaith marriages are being seen as being agenda-based. The couples who spoke to Cithara said that they had no agenda, but love. As we go into 2019, may I wish you peace and love. An electoral year is quite often a divisive year, too. These days I do not argue with my friends over politics. To me, the friend matters more than winning an argument. I am sure it is the same with you, too. Warm wishes for a Merry Christmas and a Happy New Year.